Alliance: So you’re shops in San Jose, California. What the heck do you do in San Jose? The Liquid Playground(Owner – Austin Watts): We have a really solid art scene down here so you can usually find me at an event called South First Fridays where the galleries are open late and free to the public. After that I usually grub out downtown at one of the many amazing restaurants. Original Joes is a personal fav of mine. I really wish I was down here more to soak up the music/concert scene and catch a Sharks game or two. To be honest when I usually have a day off (never) I’m usually away from San Jose Wakeskating, shopping up on Haight Street in SF, or catching up on yard work at the house (Laughs). Alliance: Tell us a little bit about your history. Where did you work prior to owning and operating your own shop? Liquid Playground: After roughly 10 years teaching pre-school and directing youth and teen community programs in San Mateo I decided to take a huge step away and make my passion on the weekends my full time job. I was playing around on WakeWorld one evening and stumbled across an ad titled “pro shop help wanted” and decided to see what the job entailed. Next thing you know I’m in an interview with Greg Nelson and I get offered the job on the spot as a pro shop manager for one of the Cope and McPheter’s/Wakespace stores. I still remember my first day at work, which happened to be the opening weekend of one of the Pleasanton boat shows. Seemed like we had the entire building filled with everything imaginable. I thought I was the luckiest man in the world! I was with them for a short spurt of maybe three years before the bottom dropped out on the boating industry and the rest is history. A: What has the downfall of Cope & McPhetres taught you and what steps are you taking to not follow that same path? LP: Really unfortunate what happened. The boat market just crumbled. When you expanded as quickly as they did and had all those boats sitting there accumulating flooring costs month after month, there was no way to recover quick enough. I was very fortunate to work next to Frank Cope 6 days a week for all those years and soak up the good and bad and take my own notes. He really took me under his wing and treated me like a son, and I feel very lucky for this. I got to see a side to this man that most never knew. We would talk for hours each day during the last few months before the closure and talked specifically about this topic when I shared with him my dream to move on and chase my own dream. Working there taught me you are nothing without customer service. No matter if it’s the guy that’s lost and asking for directions or the guy dropping a grand on the newest pro set-up, every customer gets the same treatment. I came from a huge emphasis on customer service from the recreation background and that is my #1 priority at The Liquid Playground. I’m a one man show to keep overhead to a minimum and stock a focused and balanced amount of inventory each year. I’m also fortunate for the core group of team riders that are motivated by our mission and demonstrate a great sense of team that give my customers unmatched consistency and support. I also pay cash as much as possible and try to stay ahead of bills because I know the winter is a long one. A: What was it like working with Greg Nelson at Copes? Did he try to get you to shave your head too? LP: Shave my head lol, I did that once and trust me it wasn’t pretty. Nelson was amazing to work next to. Seeing someone as passionate as him and so knowledgeable about shapes and construction was really motivating to me. It fueled a fire inside of me to really research what goes into product, where it is made, and how the product performs. He loved my passion and drive to make that old shop something unique and gave me a ton of freedom to do whatever I wanted which was awesome for my growth. Our trips out to expo and the boat show days will always be special to me. I was sober during those times so I’m sure you can imagine how it would be if that wasn’t the case. A: You’re one of only a few wake specific shops in the country. 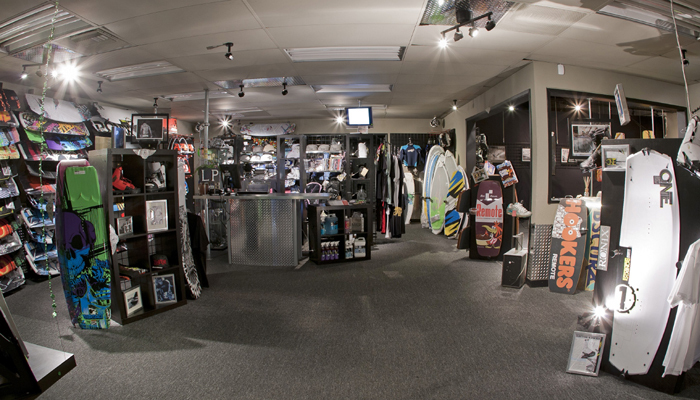 No boats; just wakeboards, wakeskates and accessories. What makes it so difficult to be a wake specific shop and what are the benefits? LP: I’d say the hardest thing is making your money in our relatively short season and then budgeting correctly during the winter months. Our season hits hard May-July with April, August and September as wild cards. Last year our weather was harsh into Memorial weekend, which really made it hard. Trust me, there was a ton of Top Ramen in the kitchen this winter. I’ve been fortunate that customers love supporting a shop that they really believe in and truly feel part of. They love spending their time and money in a shop that is built on passion and no BS. Being a wake-only shop has allowed me to offer that. When they ask me about a product they can feel the energy and love behind it because it is what I breathe. I feel the majority of today’s retail stores lack this since they’re doing a little of this and a little of that. Everything on the shelves at The Liquid Playground I believe in 110% and customers trust me because of that. If I don’t like a shape or the quality of a boot I don’t buy it. I think I drive reps crazy sometimes but I really take pride in it. Having some downtime in the winter also lets me focus my time to create new events, change up the displays, and keep everything fresh for my customers. A: The Liquid Playground is very art inspired. 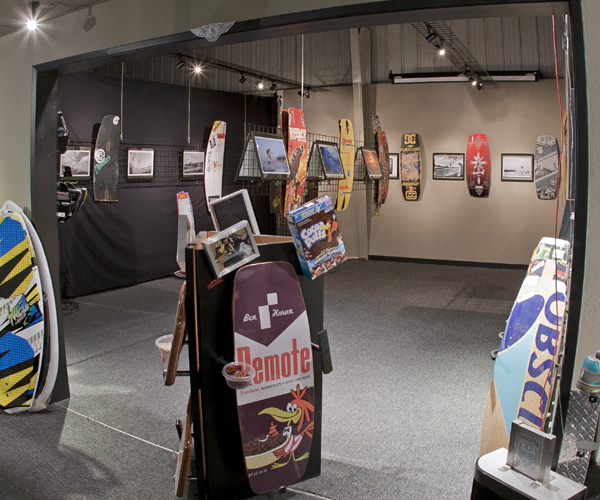 Tell us about your product displays and your new 500-square-foot art gallery. LP: It has always been my dream to walk into a shop and actually see the gear merchandised, and set off with displays that have some thought and creativity behind them. 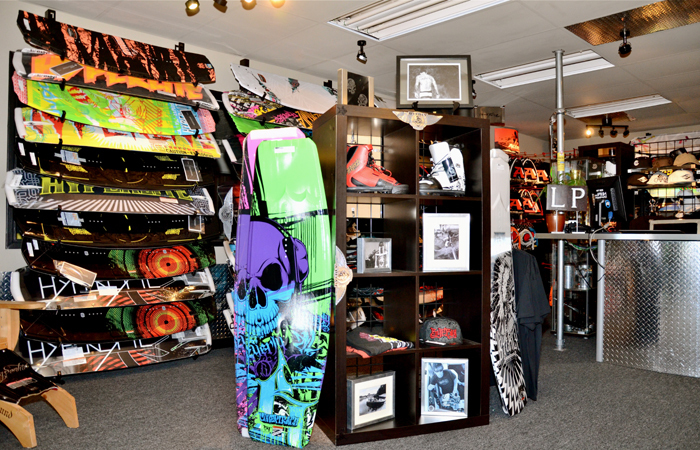 I wanted my shop to have a high end/boutique feel to match the high quality product that our industry cranks out. This is definitely what separates The Liquid Playground from the rest of the industry. Over the years we have created some really fun displays. 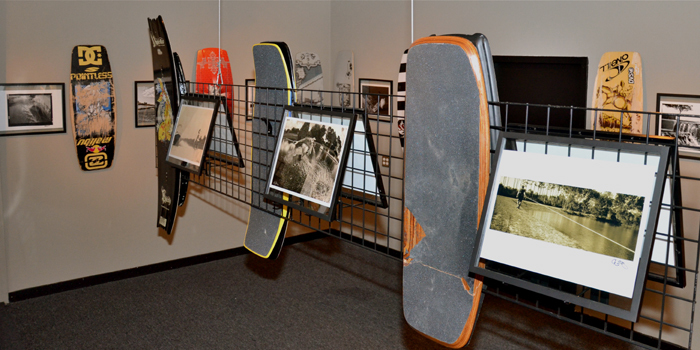 Most recently I worked on a Remote Wakeskate display that used cereal bowls, actual cereal, spoons, remotes, and a ton of framed art to set off the new decks and customers and fans really got a kick out of it. The new Ronix display came out dialed as well! I used a combination of three wood panels set up in a triangle fashion that float the boards on stainless hooks off the floor. 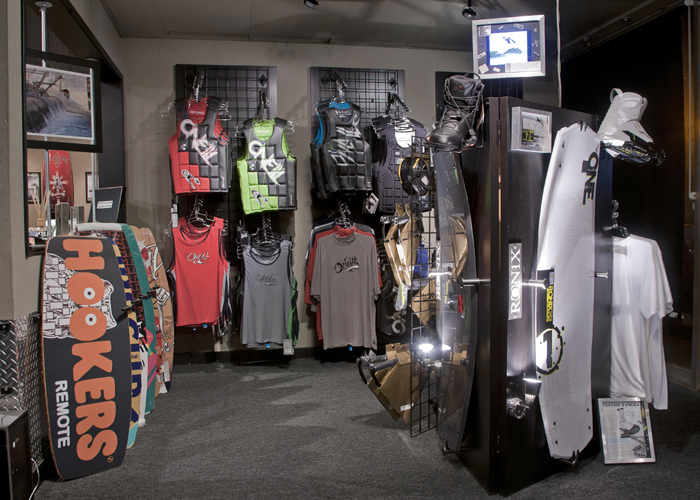 We then added polished lights, custom boot holders and even a small seven-inch video screen hiding in a frame that plays videos of the Ronix team killing it. The gallery is something that just came together this spring. I’ve always had a love and appreciation for the photographers in our industry and tried to purchase prints that stood out to me over the years. I had these around the shop and on the walls in our movie room and slowly started seeing customers really appreciate the work. That was all I needed to see to pump me up to create a full on gallery. The support from all the photographers has been nothing short of phenomenal. We now have over 30 prints featured from over 10 artists and it’s still growing. A: The Liquid Playground does a lot for and with wake community. What’s up with your “Product to the People” demo tour and the “Thursday Night Live” movie showings? LP: The “Product to the People” demo tour stemmed from a love of being on the water and interacting with customers one on one. It’s tough being a small shop and having the budget for a demo program. So we had the idea of setting up demo days at roughly 5-9 lakes in Nor Cal last summer. Our customers not only get to ride the latest and greatest product for free but also get minimal coaching from my team riders as well as surprise visits from pro riders. The “Thursday Night Live” events started as a way to get customers in the door and give them a place that they could chill and watch the newest releases as well as classic wake films. The first one was an old Cassette film that we showed to maybe 15 people on a customer’s 42 inch plasma strapped to my desk. Now it has grown to a monthly event which draws roughly 60-100 customers each showing! It’s really a nice social event where we can catch up on life and meet other riders that have the same passions as us. A: You’re known for carrying product other guys won’t. What are the brands we can expect to find in the shop? LP: We carry all the big dogs: Hyperlite, HO Sports, Liquid Force, Obscura, Ronix, Radar, Byerly, Accurate, Straight Line, O’Neill, Skylon, Fly High, Lightning Accessories, Newt Products, DVS as well as the smaller guys like Integrity, Mutiny, Remote, Original, Calibrated, Nice Rack, and Son of a Gun. 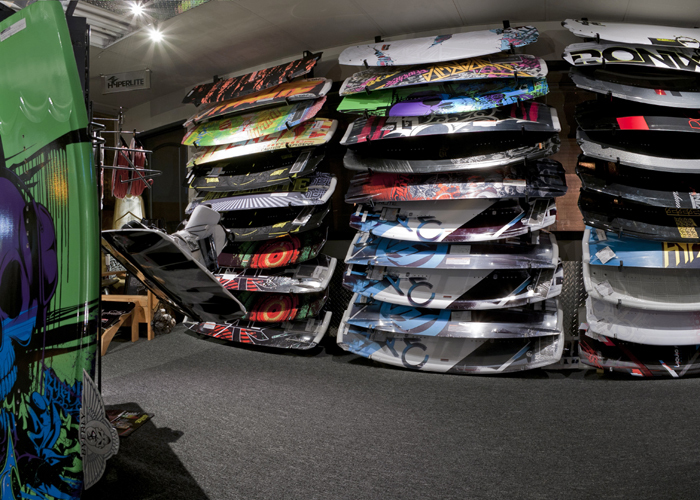 A: Why did you pick wakeskate brands like Integrity and Remote to carry in your shop? LP: I really think that these guys are the pulse of our industry and to be honest where the change comes from. The quality that Schmaltz has in his Integrity/Mutiny line has raised the bar for all the big dogs. Features like his bamboo core and urethane sidewalls are forefronts in design change and progression. I’m happy to give up a little margin to sell a customer a product that is made proudly in the USA and I know will last them years if not there entire life. Then when you look at what the Integrity/Mutiny riders and Silas and the Remote team are doing it is contagious. They’re out there every day winching, filming, progressing the sport with new tricks, creating new contests, and giving the customers something to watch and get excited about. A: You have a small team of wake junkies. Who are they and what do they ride? LP: Girls first- I have 2 women that also just got picked up by Nor Cal Hyperlite, Lizzie Williams and Lindsey Sloatman. They really are amazing and have big plans this year to push the progression of female riders. Lizzie rocks HL Urso and Lindsey’s on the Byerly Conspiracy. Then we have my 2 local INT rippers, Michael Powell-Wyatt and Michael Belligan rocking the HL B-Side and Franchise. These guys are the epidemy of the sport. They go to school and work but eat, sleep, and breathe being on the lake and helping the shop out. Next we have my super genuine and enthusiastic wakesurfer, Mikey Kozacek. 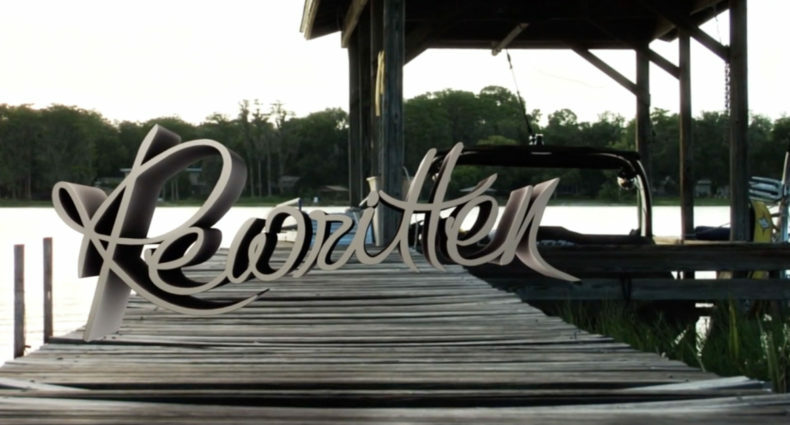 He took off almost a year from surfing then hopped on his Calibrated surf and made a podium finish in last year’s Wake 9 contest. Last but not least is my global skater, Keaton Bowlby. He’s part of the scene I talked about above. Riding every day, filming, shooting, and progressing the sport for the right reasons, LOVE and Passion! He’s rockin a Remote right now. 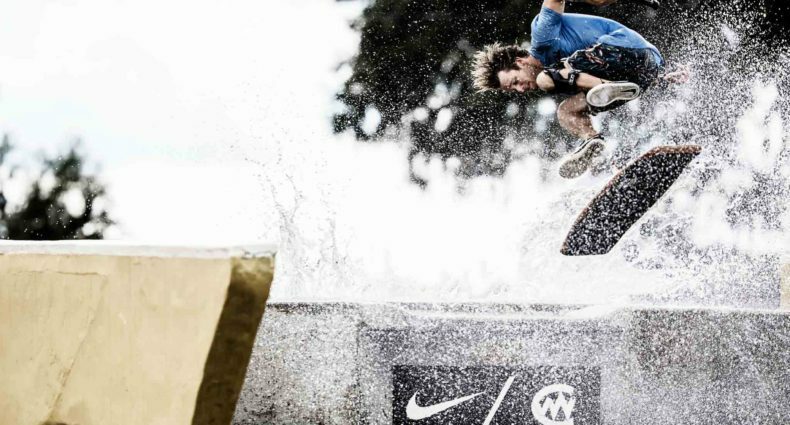 A: What can we expect next from the Northern California crew at The Liquid Playground? LP: Focusing on fine tuning our “Product to the People’ demos with more pro rider involvement and hopefully a boat sponsor. Start to utilize the gallery space as much as possible with 3-4 exhibits this summer with a featured artist at each. Our Nor Cal Convergence Wakeskate events will be bigger than ever featuring full on rail parks, movie premiers, and pro rider guest lists. We’re also excited about helping the women’s movement by being a huge sponsor and participant in the Girls Ride the Wake Event. You can also get ready for a small web store mid summer. A: Any last words or shout outs you want to make? LP: Huge thanks to my mom, little brother, bub, close friends, and my team riders for believing in me and helping me make this dream a reality. Joe and the crew at HO Sports have done more than I could ever imagine and are a class act in our industry. Chris and the LF crew, Silas at Remote, Schmaltz up at Integrity, Nick at Newt Juice, CM for our chats, Scott A. for amazing photo work, Bill and Rusty at Alliance for this opportunity, and Epic my shop protégé. But most of all YOU the readers of this magazine, the customers, the weekend warriors, the beginners… we are nothing without you and you are what makes this sport stay alive, and what makes me want to give my heart and soul to this sport. Thanks for the love. A.Watts and The Liquid Playground!! i wish i had an LP here..
Yay for the LP and Austin!! Congrats!! Austin is the man! Does more for the sport than any other shop out there hands down! Support LP and go buy something!